It may seem counterintuitive, but remote work enables DevOps success and satisfaction, helping overcome the top DevOps adoption challenges. According to our 2018 Global Developer Report, remote teams tend to trend higher in visibility and DevOps satisfaction compared to in-office teams, suggesting that a remote workplace culture is more conducive to DevOps adoption. As a remote-only company, this finding naturally piqued our interest. We started thinking about the traits of a remote team and how these characteristics set up operations and development teams for success. One of the greatest difficulties an organization faces when adopting a DevOps model is a resistance to culture change. Because DevOps requires teams to collaborate and communicate in new ways (and at an increasing frequency), historically siloed teams may have trouble adjusting. This type of radical shift in culture can be too difficult for a team to handle and may result in an increase in friction and frustration. How can teams that have traditionally worked alongside each other - but not together - suddenly adopt a model that encourages them to contribute to a single conversation across every stage? In our survey, we learned that 20 percent of respondents say most or all of their development team works remotely. Every remote worker knows the importance of communicating effectively and frequently to ensure that others are aware of decisions and progress. Without the convenience of physical proximity, working remotely requires a commitment to open discussion and an understanding that team members must be able to easily view projects and receive updates. Furthermore, remote teams use tools to work concurrently, decreasing the challenges of siloed workflows. When operations and development teams already have a culture founded on trust and transparency, they can more easily adopt a model that fosters cross-functional communication and workflows. Remote teams are already accustomed to transparency, collaboration, and visibility, making a DevOps adoption a seamless transition. Because teams must document discussion conclusions, an inherent benefit of working remotely is complete real-time visibility of all projects and activities, an advantage of the DevOps model. How Can In-Office Teams Ease DevOps Adoption? While a remote workplace culture appears to create a solid foundation upon which a DevOps model can thrive, we concede that remote teams can still encounter challenges to adoption. Poor communication, internal conflict, and a lack of defined processes can hinder any team. 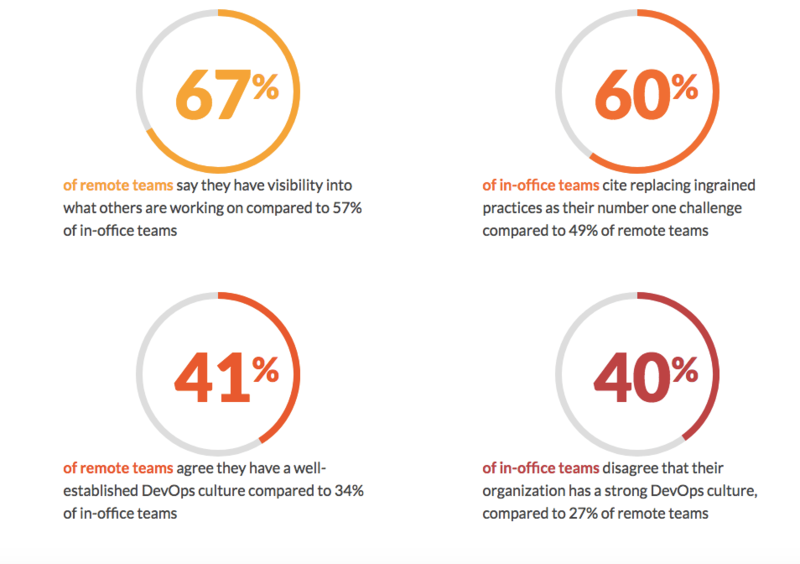 However, there are insights that in-office teams can gain from these findings. Because culture is the underpinning of successful DevOps adoption, in-office teams can ease challenges by encouraging teams to work concurrently and by transparently documenting conversations and decisions. Furthermore, a shift towards empathy can help teams gain respect for the work that others accomplish, a change that can increase collaboration and decrease friction. By creating a collaborative culture, an organization can facilitate a smoother transition to a DevOps model. Does your development team work remotely? Let's chat about DevOps and remote working! Tweet us @gitlab.